We present a View of the Workmen's Hall which has lately been built, at the expense of Mr. W. Leaf, of Streatham, on ground bestowed by the Duke of Devonshire, in the pleasant and improving town of Eastbourne. The opening ceremony took place on Thursday, the 9th inst., with a procession through the principal streets, and a large and influential meeting at the hall, where the Duke of Devonshire delivered the inaugural address; Mr. Leaf was also present. Among other gentlemen who took part in the proceedings were. the Rev. Henry Solly, secretary of the Working Men's Club and Institute Union, some of whose recommendations have been adopted in the plan of the Eastbourne Hall; Mr. Samuel Bowley, of Gloucestershire, a well-known advocate of temperance and popular education; Dr. Hayman, chairman of the local committee; and Messrs. G. A. Wallis and James Dexter, active promoters of the institution. The formal opening, on Thursday morning, was succeeded by tea-meetings on the Thursday, Friday, and Saturday evenings, with suitable addresses or speeches, and a concert on the Monday evening. The new building, engraved from a photograph taken by Mr. G. W. Hale, occupies a corner plot of ground in the Seaside-road, about midway between the Anchor Hotel and Ordnance-yard, presented by the Duke of Devonshire, and has a frontage of 42 ft. by a depth of 150 ft. The style of the architecture is Continental Gothic, and the edifice is built of red, white, and black brick, with Bath stone windows and doors. The design includes a tower, which occupies the south-east angle of the building, and through which is the principal entrance. The building affords the following accommodation-viz., public coffee-room, library and reading-room, serving-bar, smoking-room, kitchen and hot closet, and the means of cooking for about 200 people, when required; large lecture-hall, capable of accommodating 300 persons, with gallery opening into it for orchestra; retiring-room for lecturer, and private staircase. This hall is lighted by windows at each end and skylights in the open-timber roof. The premises also afford a yard for a skittle-alley, a place for smoking out of doors, and lavatories. 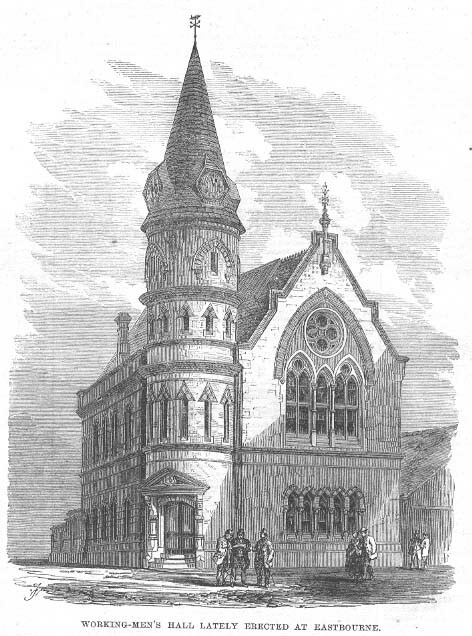 The architect was Mr. R. K. Blessley; the builder, Mr. W. H. Standing, of Eastbourne. It may be well here to notice the completion of a great public improvement in this picturesque and salubrious town. The Esplanade has now been extended westward a further length of 700 yards, making the New Parade more than l000 yards long, and affording with the Old Parade, a continuous paved walk of 1300 yards. Drainage works, costing above £10,000, have been commenced, and partly executed, which will carry the sewage of Eastbourne to an outfall two miles beyond the eastern end of the town. The number of handsome villas lately erected in the place shows that its advantages are appreciated; and a large mansion has just been engaged by the Sisters of Mercy of All Saints', Margaret-street, Cavendish-square, to serve as a sanatorium for the invalids under their care.